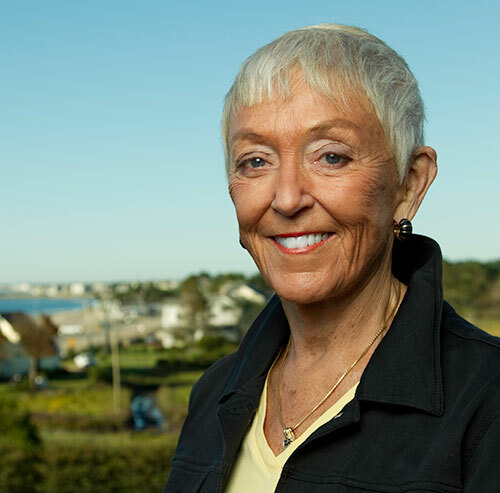 Josephine A. Lamprey is a retired businesswoman, environmental pioneer and benefactor of sustainability programs at UNH. In 2012, she made a gift that established The Josephine A. Lamprey Professorship in Climate and Sustainability, held by research associate professor Cameron Wake. 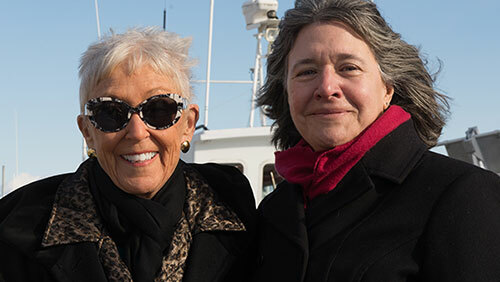 Additional gifts to UNH, where she serves on the UNH Foundation board of directors, have supported climate fellows in the UNH Sustainability Institute and the green grid at the UNH/Cornell Shoals Marine Laboratory as well as social innovation programs at the Carsey School. She spoke with Jan Nisbet, senior vice provost for research, about climate change and philanthropy. How did you get involved with climate change research at UNH? It started when I saw “An Inconvenient Truth.” At the time, I was the owner of a retail fuel company, Lamprey Brothers. The film motivated me to refocus our company from selling a product — oil — to helping our customers to burn less oil. So we produced a free educational program for customers focused on sustainability called “This Old Planet Needs a Friend.” The presenters included Cameron Wake, [UNH Sustainability Institute director] Tom Kelly, [“This Old House host] Richard Trethewey, and me, and we filled the house. I learned a lot from Cam and Richard, but I was the most intrigued with Tom Kelly’s talk about the four circles of sustainability. You mean climate, food, biodiversity and culture, and how they intersect? Exactly. I visited UNH, had a tour, learned about Wildcat Transit (the largest transit system in New Hampshire), the cogen [combined heat and power] plant fueled with methane gas transported underground from the Rochester landfill. I didn’t graduate from UNH, but I grew up nearby so I had an awareness. All the work at UNH is so exciting, it makes me want to go back to school. Prior to returning to Lamprey Brothers, the family business, I was cofounder, part owner and developer of a health care consulting company focused on quality and cost containment for hospitals. We developed many clinical tools still in use today. In ’98, we sold the company, which resulted in my ability to become a philanthropist. UNH has afforded me the opportunity to give back in ways I never would have considered. I began with a fellowship, which became a professorship in climate and sustainability. I feel blessed to have the opportunity to work with Cam and Tom, two very talented individuals. Everyone knows you’re really feisty. Do you still meet climate change deniers at cocktail parties? I don’t get the resistance I used to. When I joined the UNH Foundation board, there were a few people I took on as a challenge, and now we’re buddies. I live on the ocean, so I can tell you about the devastation on the beach. The high tides are higher, they’re more ferocious and causing major erosion. And the low tides are much lower. What advice would you give other institutions of higher education on addressing climate change and sustainability? It has to start at the top. I know [UNH President] Mark Huddleston is very committed to leaving a legacy of sustainability. He has the energy, and he’s put together the right leadership team. The whole fabric of UNH is focused on sustainability. And the university is becoming more interdisciplinary, which will be necessary to address climate change.